Kelly Kinkaid, supervising producer of the popular Sirius XM radio show “Sway in the Morning,” popped a bottle of champagne, refilled the glasses of her guests and proposed a toast. 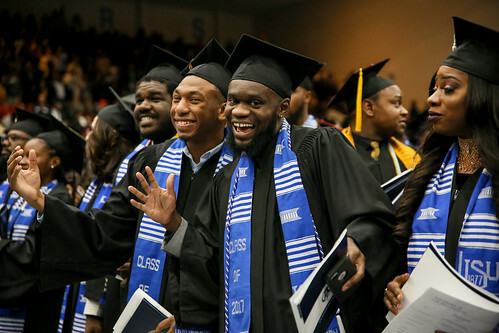 It was the Saturday morning of Jackson State University’s 2018 homecoming weekend. Kinkaid, a JSU alum, hosted an inaugural breakfast at the Hilton Garden Inn in downtown Jackson. She is planning to turn the event into an annual scholarship brunch. The Flint, Michigan native expressed her desire to reach students who may not be able to compete academically but still have a drive and determination for their field. Instead of exploring her artistic side, Kinkaid moved back home, at the urging of her father, and enrolled in the management training program at Meijer – a Midwestern regional supercenter chain. Once she became head of the deli department, her father viewed the move as a sign of her potential with the organization. “He was like you’re going to have your own store. The bigger goal, the promise land was me moving to Grand Rapids (Michigan) and working in corporate,” she said. Soon after that, a friend moving to New York invited her to tag along, and after a conversation with God, Kinkaid decided to head east. “I had $400 and two big bags. My parents looked at me like I was crazy when they took me to the airport,” she said. Kelly Jackson, who goes by Kelly Kinkaid in the entertainment industry, attends College Signing Day in NYC and represents her HBCU. She is pictured with Michelle Obama, former first lady of the United States, and Sway Calloway, host of the Sirius XM Show Sway in the Morning. It was 1991 when Kinkaid arrived in the Big Apple. She balanced a job at TGI Fridays while interning at music labels like RCA, a subsidiary of Sony, EMI and Columbia Records. Kinkaid also worked with myriad executives and artists who were influential in educating her on the industry. “I had the passion, spirit and determination that I was going to make it. I didn’t want to go home,” she said. Aside from experience, the alum also gained friendships. One particular bond she established was with Sway Calloway, a popular journalist and radio personality, who would eventually host MTV shows “Total Request Live” and “Direct Effect.” When Calloway, an Oakland native, talked about making a permanent move to New York, Kinkaid invited him to share her large two-bedroom apartment. As a friend, Kinkaid began fielding requests for Calloway, and the two became a dynamic duo in the business. When rapper Eminem decided to expand his Sirius XM radio station Shade 45, he called on Calloway and the show “Sway in the Morning” launched in July 2011. Initially, the alum intended to work on the show just long enough for Calloway to settle in, but “seven years later I’m still there,” she said. As a woman working in a male-dominated industry, Kinkaid said that people tended to peg her as Calloway’s assistant. But instead of fighting for relevance or standing on a soapbox, the alum is very clear about who she is and what she does. In 2011, she and Calloway launched the joint venture OverDeliver Entertainment. Among their roster of artists, she advised people to watch for Oswin Benjamin, a rapper and singer, from Newburg, New York. Benjamin’s album “GODFREY” will be released on Feb. 22.